Presents a computational mechanism that functionally mimics human perception in being able to generate three-dimensional descriptions of objects from two-dimensional line drawings. Kokichi Sugihara wrote:"Machine Interpretation of Line Drawings" was first published with the MIT Press, Cambridge, massachusetts, in 1986 as one of the MIT Press Series of Artificial Intellignece. Recently, the MIT Press decided not to print copies any more, and hence it becomes difficult to get one. However, the MIT Press kindly allowed me to post all the book pages in my web site for anyone to be able to download. 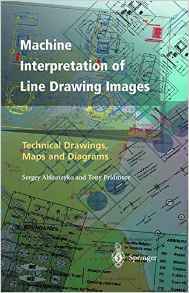 This book presents a computational mechanism for the interpretation of line drawings by means of which a machine can extract three-dimensional object structures from their pictures drawn on a two-dimensional plane. It is easy for a human being to understand what is represented by line drawings, so that they are frequently used in many stages of human communication, such as illustrations in books and engineering drawings in factories. For a machine, on the other hand, line drawings are simple collections of twodimensional line segments; some intelligent mechanism is required to extract three-dimensional information from them. How the machine can possess such intelligence is the main problem attacked throughout this book. From a theoretical point of view this book provides a typical example of making humanlike intelligence by a simple computational mechanism. We are apt to think that the human ability to interpret line drawings is based on various kinds of human experiences, and hence a mechanism that mimics this ability should be supported by extensive and complicated knowledge about the outside world. However, it turns out that this ability can be realized by a simple mathematical procedure at least when the objects are restricted to planar faced solids. The computational mechanism presented here is not accompanied by a large database, but is composed of several simple procedures based on linear algebra and combinatorial theory; it can still mimic human flexible intelligence in picture perception. From a practical point of view the results in this book can be applied to man-machine communication and robot vision. One of the main problems in a computer-aided system for geometric design is how to input data about object structures that are born in a designer's mind. The computational mechanism in this book makes the communication flexible in the sense that the system can extract object structures automatically from pictures drawn by the designer. In a robot vision system for recognizing the outside world, the present results can be used as an intermediate stage, which receives line drawings from an image processing stage and offers the descriptions of three-dimensional object structures to an object recognition stage.